There are a mind-numbing number of camera backpacks on the market today – B&H carries 501 of them as of review time (including single-strap sling bags). However, the majority of these are not designed to carry the really big lenses. If the Canon EF 600mm f/4L IS II USM Lens needs to be carried, remaining options are very few. I have long carried my 600 f/4 in a Think Tank Photo Airport Security V 2.0 Rolling Camera Bag and while this case has some advantages over the FirstLight 40L, weight and backpackability are not two of them. As you probably guessed from the name, the FirstLight 40L is designed to be as light as possible and as a backpack, it is made to be very comfortable while carried on the back. 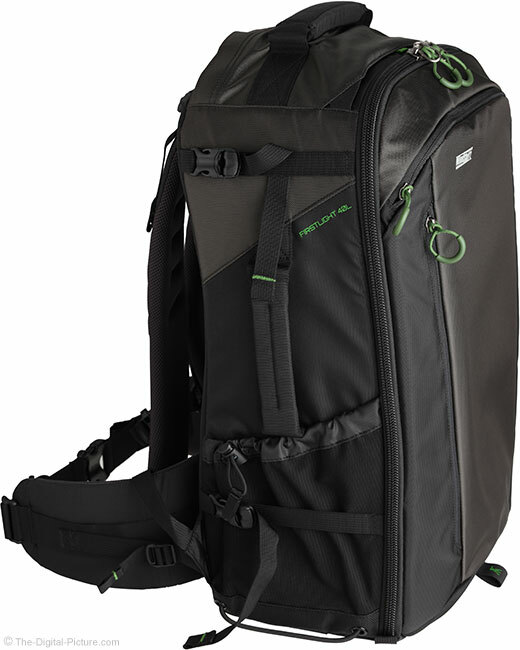 As indicated by the 40L, this pack's storage space is voluminous. With MindShift gear in the name, quality construction is the expectation. 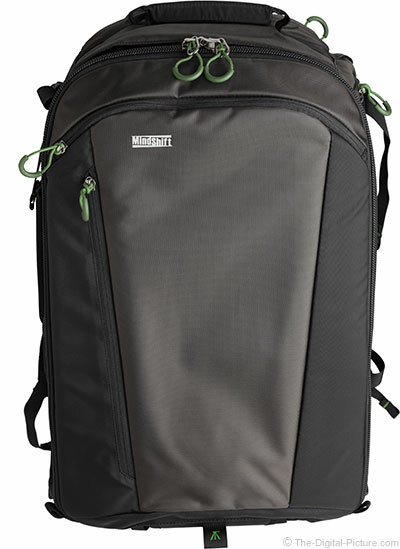 Note that, if 40 liters is more space than you need, MindShift Gear covers your back with the smaller FirstLight 20L and 30L. The very strong, thickly-padded carry handle is perhaps the most prominent feature on the top of the case. The top handle is important as this is how the pack is lifted to put an arm through the shoulder strap. Also prominent are the glove-ready stay-open cord-loop zipper pulls and the large, rugged zippers they are attached to. The zipper pull shown at the bottom of this image provides access to a thin pocket covering the top of the case. A small green tab hiding between the primary zipper pulls is used to separate the Velcro holding another small pocket closed, this one holding an adjustable tripod strap. When carrying a heavy pack (or even a light one for a long time), it is ideal to have the weight of the pack riding on the waist. There is no getting away from our legs carrying the load, but including the shoulders in the job just makes the effort greater. With a hook-and-loop height-adjustable harness system, the FirstLight 40L can be adjusted to a very wide range of torso lengths. 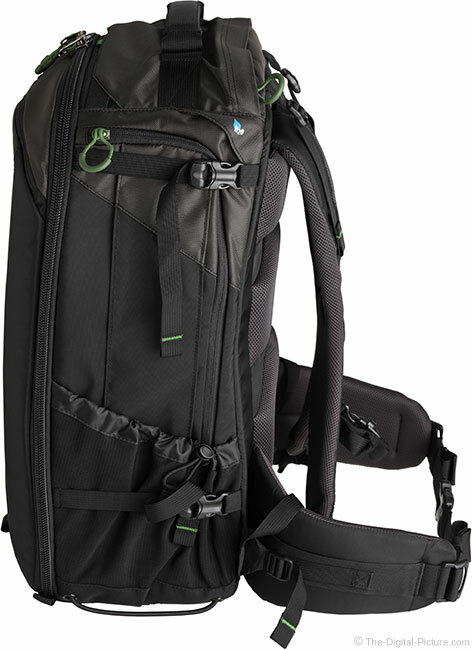 Additional adjustment straps enable the overall fit to be dialed in to individual needs. The sternum strap is both height and length adjustable and, as always, the waist belt is adjustable in length. Three non-elastic webbing attachment points are provided on each shoulder strap and three elastic loops are also available. While very light, the harness system provides a nice amount of cushioning everywhere it contacts the body. A strong, modestly-padded handle is provided on the left side of the case. This handle is useful not only for carrying the case, but for assisting in taking the backpack off. Remove the right arm from the shoulder strap and take hold of this handle to lower the pack. An adjustable elastic pocket at the bottom can hold, among many other things, a water bottle, tripod or monopod. 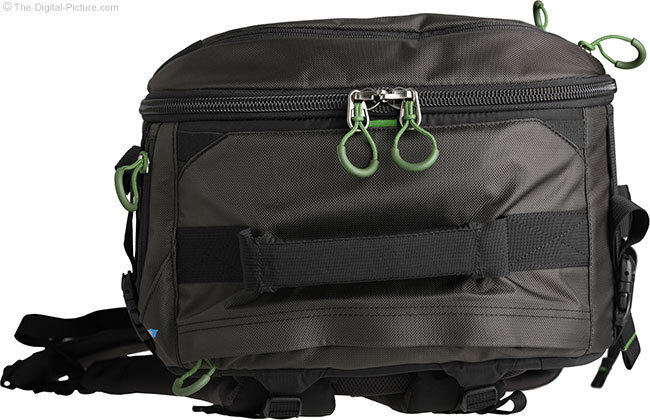 A pair of adjustable straps provided at the top and bottom are ideal for lashing in a tripod, clothing, hiking poles, etc. While considered compressions straps, these will only be useful for compressing what is held externally. The case is rigid enough to not compress appreciably. An elastic cord is provided at the bottom of the side. The right side of the FirstLight 40L is similar to the left with one big exception. In place of the handle is a large, zippered, expanding pocket designed to carry a 3L hydration bladder. This pocket can be used to hold other items as well. 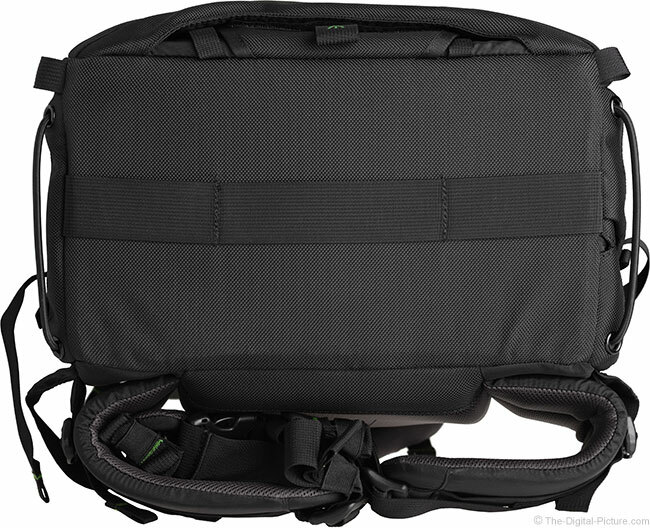 The bottom of the backpack provides heavy duty webbing, useful for attachment purposes. The front of the case, with a pair of thin, full-sized pockets, is rather smooth in appearance. The larger pocket measures roughly 12.5" W x 18" H (holds a large laptop) and the smaller pocket in front of the larger pocket has space for a rigid item that measures roughly 10.5" W x 12" H. Both of these pockets are sized to the full front of the backpack and have some additional space beyond their zippers that is not included in the measurements, but contents would need to be flexible to take advantage of this space. The two pockets share a roughly 1.5" depth, but there is some flexibility in how that depth is utilized. 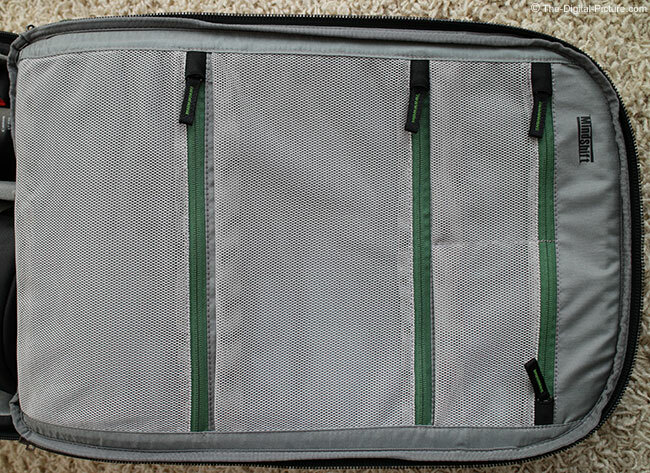 The outer material of this pocket area is not padded, so a padded sleeve is not a bad idea if carrying a laptop. A tab at the bottom of the front is used to separate the hook-and-loop fastener holding the cupped nylon tripod leg holder and a cinch strap in a dedicated pocket. The dimension table sums up a lot of what this backpack is about: light weight and large volume. Exterior Dimensions 13.8 x 21.7 x 9"
(35 x 55 x 22.9 cm) 12 x 19 x 8.7"
(30.5 x 48.3 x 22 cm) 11.4 x 18.7 x 7"
Interior Dimensions 13.4 x 20 x 7.3"
(34 x 51 x 18.5 cm) 11.2 x 18.1 x 7.1"
(28.5 x 46 x 18 cm) 10.8 x 17.5 x 5.3"
As of review time, this backpack complies with USA airline carry-on size requirements. When listing the gear profile for this backpack, MindShift Gear states: "Holds 2 gripped DSLRs with 6–8 standard zoom lenses and 1–2 flashes. Maximum lens size: 600mm f/4 lens detached or a 500mm f/4 attached." The product images on MindShift Gear's website show examples of this pack comfortably holding kits of smaller lenses up to the 600 f/4 unmounted. However, based on the pack's dimensions relative to the Airport Security's dimensions, I thought I could get a pro-body-mounted 600 f/4 to fit. As you can see from the image below, I was successful. 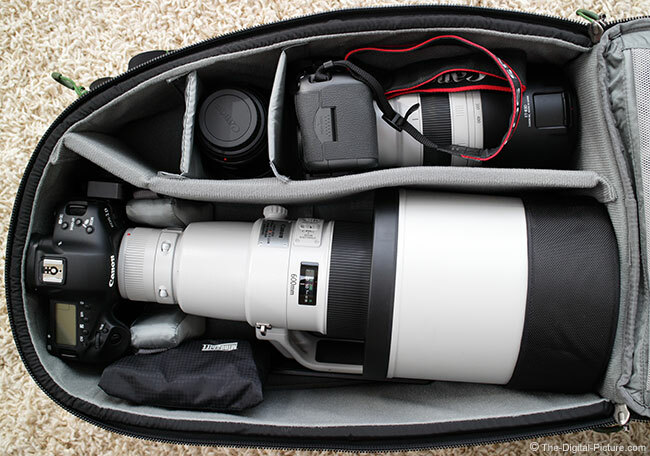 Shown in the backpack above is a Canon EOS-1D X mounted to a Canon EF 600mm f/4L IS II USM Lens. This fit is quite snug, pushing the pack's dimensions slightly, but I've found it very usable. This is the backpack option for this combination that I've used to date – the pack makes the camera and lens seem smaller. Beside the big lens in the image above is a Canon EOS 5Ds R with a Canon EF 100-400mm f/4.5-5.6L IS II USM Lens mounted and ready for immediate use. An L-series general purpose zoom (I can't remember which one) is the other lens shown. Also shown in this image is the included rain cover. Plenty of room for other items, including some decently-size ones, remains. I added 1.4x and 2x extenders before leaving for an eagle photography trip on this day. The lid, shown below, also has generously-sized expanding mesh pockets for holding smaller items such as cables, memory cards, etc. The mesh makes these items easy to locate. "Exterior: For superior water resistance, all exterior fabric has a durable water-repellant coating; the underside of the fabric has a polyurethane coating. It also has the highest quality abrasion-resistant YKK® RC-Fuse zippers, 420D velocity nylon, 420D high-density nylon, 1680D ballistic nylon, 210D nylon, 320G DuraStretch mesh, nylon webbing, 350G airmesh, nylon webbing, 3-ply bonded nylon thread." "Interior: 210D silver-toned nylon lining, belly-o mesh pockets, high-density closed-cell foam, PE board reinforcement, 3-ply bonded nylon thread." In addition to the materials being high quality choices, they look great as well. And, being very easy to clean, they stay looking good. My pack spent much of a day in sandy mud alongside a stream. With very little effort, on my part, the pack shows no signs of this use. The zippers are smooth and, especially with the large loop pulls, are easy to use even with gloves on. If I am carrying $25k worth of camera gear (as shown above – or even far less) in my backpack, you can be sure that I will be using a pack with construction that I fully trust. This pack has gained my trust. 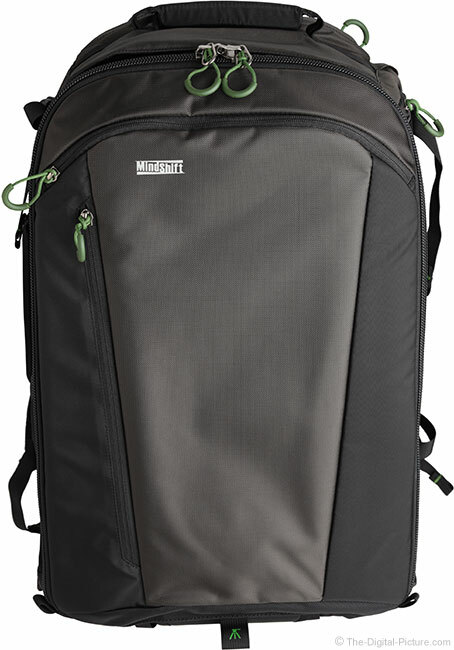 Why the MindShift Gear FirstLight 40L? Rounding up the answers to the why? question: light weight, large volume, quality build and reasonable price. While those last three items are easy to understand, the first may need some help. To put things into perspective, this backpack weighs only 6 lbs. (2.7kg) – that is a huge 6-8 lbs. (2.7-3.4 kg) less than the Airport Security and similar cases. That is an apples to oranges comparison in some respects, ... but it is hard to find other apples. 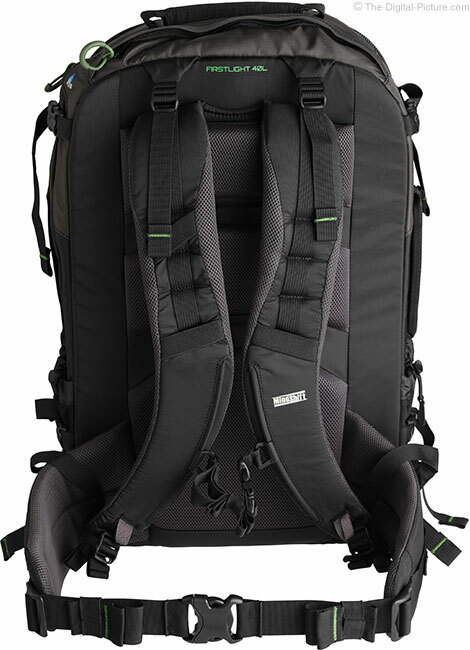 The Lowepro Pro Trekker 450 AW is a high quality backpack with larger overall dimensions and smaller internal dimensions (it cannot hold a lens as large as the 600). It weighs in at 9.0 lbs. (4.1 kg). Especially when carrying gear that is already heavy, a lighter weight pack is a big benefit. Your body will feel the difference at the end of the day. While not having wheels means carrying the weight on your back through airports, having those wheels can be a liability in this same location. Have you ever been boarding an aircraft (even a 747-sized plane) and met by airline staff forcing all "roll-aboards" to be gate checked on the ramp? While this occurrence is infrequent, I have had it happen. I was fortunately carrying a backpack at the time, but the incident happening still strongly concerns me. Making that fear even greater was having watched such gate-checked bags being slid down a long tube, landing unbuffered at the tarmac level. I do use roller cases, but I likely have priority boarding on a large-sized aircraft for all legs of the flight if doing so. Along with the heavier weight of a case like the Airport Security comes some higher impact protection from the frame and handle system alone. Hard cases such as those made by Pelican also offer more impact protection at the expense of weight and backpack straps. The FirstLight is adequately padded, just not as rigid as these other cases. With a large volume of space available, a downside is that you will be tempted to load too much into this pack. However, this is merely a discipline issue – not a product issue. Resist the urge – take what is needed, not what fits. MindShift Gear provided this evaluation pack in late Sep 2015 and I have been using it ever since for my long lens carry needs. 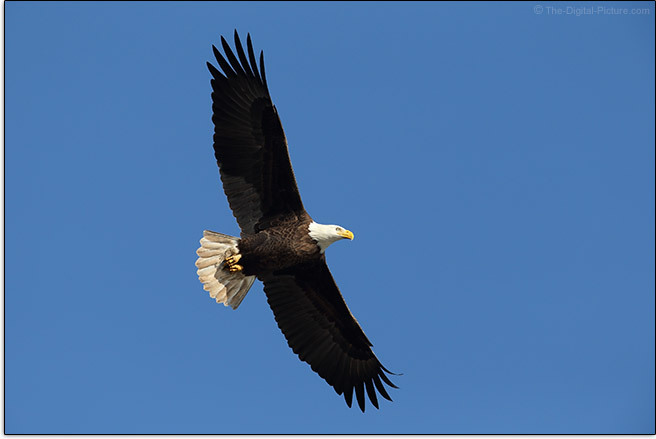 I have taken it to photograph eagles, wood ducks and great horned owls. I know, you're thinking this case is "for the birds", but I've also used it at many sporting events as well. It has performed flawlessly. I've been looking for a great long lens backpack for a long time. This is the one I was waiting for. I plan to use the MindShift Gear FirstLight 40L as my primary long lens pack going forward and have no hesitation in recommending it to you. If you like what you see in this case but don't need as much size, consider the FirstLight 20L and 30L options.